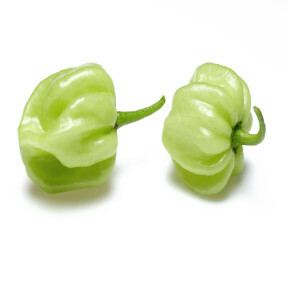 This chile is very similar in flavor, texture, size and heat as its’ cousin the Scotch Bonnet pepper. When fully ripe, these chiles range in color from yellow-green to red. They measure about 1.5 to 2 inches in size. 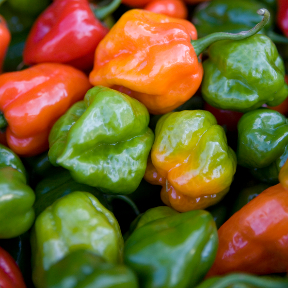 Habaneros are typically used in salsas, meat marinades and jerk sauce. 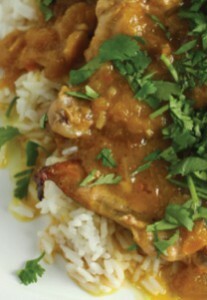 Even with its pungent heat, Habanero-type peppers retain a sweet, tropical flavor. The fully mature Red Habanero will be sweeter and offers a fruitier flavor than the that of the green variety. Handling: Red Habanero chile peppers are synonymous with sauces and cuisine that offer a significant amount of heat and spice. The peppers are popularly cooked down to make vinegar based hot sauces and pepper jelly. 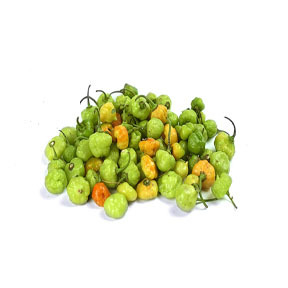 Fresh and roasted Habaneros can be chopped and added to salsas, chutney, dressings and marinades. To slightly minimize the heat of the Red Habanero chile pepper the seeds can be removed prior to using.